MotoXAddicts | Cooksey’s Hard Truth: Depression, Concussions, Motocross and Hope! In Motocross and Supercross there is a silent killer affecting aging racers: brain injury. Brain injuries are serious and have repercussions felt long after the injury is sustained. Unlike a knee or shoulder, brain injuries often go undiagnosed as symptoms of the injury are not present until many years later. Recently, the NFL has brought Chronic Traumatic Encephalopathy (CTE) to the forefront of mainstream knowledge, as many former players have suffered from years of brain injuries. CTE is a progressive and degenerative disease of the brain that is found in athletes who have sustained repetitive brain trauma (from both concussions and hits that do not cause concussions). A high profile NFL example is the likable former San Diego Charger, Junior Seau. With millions of dollars in the bank and a blossoming TV career, he seemed set for a perfect retirement scenario, but beneath the surface, his brain was showing signs of CTE. Although symptoms begin manifesting around the age of 40, athletes who suffer brain injuries prior to the age of 12 are more susceptible to this disease. Tyler Evans recently passed away and from everything we’ve been told about Tyler, he carried many of the symptoms that could be linked to a brain injury. In motocross, I am very happy to see companies advancing the protection capabilities of helmets. The sport is beginning to embrace safety and I am pleased to see this change, but for racers from the 90s and early 2000s, the damage has already been done. Some symptoms of brain injury are depression, impulsive behavior, emotional instability, substance abuse and suicidal thoughts or behaviors. Depression is not something most of us in the motocross community feel comfortable talking about, but I can’t help but notice the alarming number of friends and former racers I have known who have committed suicide. When compared with friends who do not ride motocross, the number is troubling to say the least. Three former high-profile racers—Brian Swink, Tyler Evans and Marty Moats—are remembered for their racing style and results but unfortunately also for the way their lives ended, much like Junior Seau and BMX rider Dave Mirra. Their suicides took place around the age of 40–50 (Tyler was 38) and it’s hard not to wonder if years of impacts and concussions directly affected their mental health. Head injuries are directly linked to increased depression. As a disclaimer, I am not saying depression or head injuries alone caused these men to take their own lives, but the connection is undeniable. If I am being honest, I too have experienced a personal battle with depression and believe the multiple concussions and repetitive impacts sustained over my entire life have contributed negatively to my mental health. It is embarrassing to admit to the world, but here it is: I struggle with depression. It is not easy to talk about depression because of singular views of what depression looks like (weakness) and how depression should be treated (pharmaceutically). I can be a proud person, and admitting I am depressed is difficult, but weak, definitely not! Marty Moates was the first American to win the 500cc USGP at Carlsbad back in 1980. He sadly took his own life in 2006. Depression has a way of tricking the people that are closest to us into believing everything is fine. At times, I can be a master of faking happiness. I am good at pretending to be happy. When in reality, I just want to feel good and be happy. I have all the ingredients of a happy life: a career I enjoy and work hard at every day, a family I love and the ability to ride dirt bikes when I want. Still, some days none of that matters when depression takes hold. Most of the time I do not have an underlying reason for being depressed. I am learning that I self-sabotage in order to have something to feel sad about. I will inadvertently create drama or start a fight with my wife in order to give my feelings purpose. Only recently have I become aware that I do this, and it is usually when I don’t have much to keep my mind busy. In my saddest episodes, I have experienced fleeting moments of suicidal thoughts, wondering if it would be easier if I just died, wondering what life is about and why am I here. I will often search for a task or activity to occupy my mind. If I buy a new motorcycle, will I be happy? If I move to another state, will I be happy? If I work harder, will I be happy? Sometimes I will search for a tangible cause of my depression, usually blaming random things that are insignificant when the reality is that I am dealing with a brain injury. Because brain issues are difficult to detect, they are usually dismissed or ignored. I can’t blame my depression solely on my head injuries or specifically motocross because depression has many causes, but I am certain the head impacts throughout my life have not helped my situation. 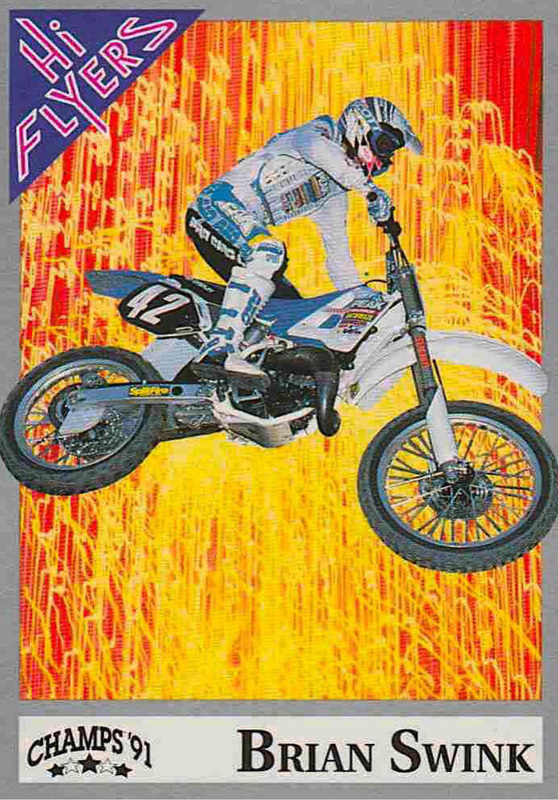 Brian Swink was known by his racing peers as one of the most naturally talented riders to ever throw his leg over a dirt bike. We sadly lost Brian earlier this year to suicide. I believe depression is a contributing factor of the drug abuse and alcoholism that is rampant with former and current motocross racers. I too have struggled with substance abuse. In 2008, I suffered a series of serious injuries. I was quickly and easily, placed on pain killers for about a month straight. I immediately noticed that not only did they help my physical pain, but they also numbed my mind. Doctors continued to prescribe them for my physical pain, but I was using them to medicate my mental anguish. After about a year of taking pain pills daily, I decided this was not a viable long-term solution and that it was taking a toll on my personal life. After a lengthy battle with opiate withdrawal I got clean. To this day many of my family and friends think my issues were with physical pain, but it was the mental anguish that kept me taking pain killers. I currently follow doctor recommendations, using anti-depressants, and see a therapist regularly to treat my symptoms of depression and anxiety. While medication can help manage my depression, the effects seem to have diminished through time and the idea of increasing or taking more pills is nauseating. I first heard about Transcranial Magnetic Stimulation from UFC fighter Cat Zingano. She explained the treatment while she was a guest on the Joe Rogan Experience. The logic behind the groundbreaking treatment is solid: treat the problem not the symptoms. Transcranial Magnetic Stimulation is approved by the FDA and some insurances companies cover it, once approved. You can find more information at HPRTC.com. Throughout the coming weeks I will be receiving treatment and sharing my experience with the goal of improving my life and the lives of anyone else who is suffering with similar issues. I am determined to find living treatment for brain injuries! I invite you to follow me on this journey, and I will be posting a series of articles and videos with updates on my progress. I document my story and talk to Doctors about my TMS treatment with HPR Treatment Center. If you are struggling to cope and would like some emotional support, call the National Suicide Prevention Lifeline at 1-800-273-8255 to connect with a trained counselor. It’s free, confidential, and available to everyone in the United States. You do not have to be suicidal to call. Follow my journey at chriscooksey61 on Instagram.